This is a nice spring soup, although you could really make it any time of year because it works well with frozen peas. The mint and lemon give it a refreshing, bright flavor, and it’s super easy to make. The recipe that inspired me does not call for a high-powered blender, but I was glad to have one because I did not have to thaw the frozen peas, and since the peas were frozen I didn’t have to re-chill it at the end either. 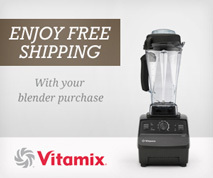 I’m also guessing that using a Vitamix or Blendtec gives it a smoother consistency. 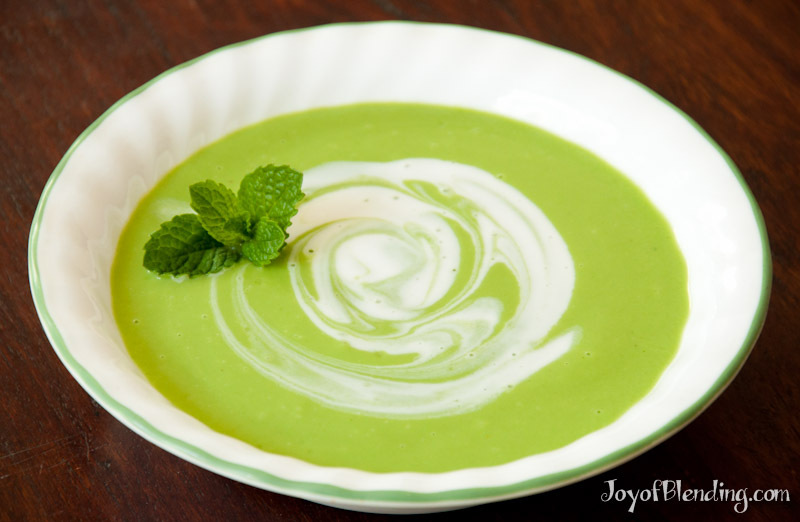 Makes 5½ cups of tasty mint pea soup. You can just blend everything on high until smooth, or if you want to minimize bubbles you can first blend everything but the avocado (~45 sec), use the bubble removal trick, and then add the avocado and blend for another 10 seconds and then do another round of bubble removal. Garnish with a bit of coconut milk and mint leaves. Food Safety Note: There is a slight risk from using frozen vegetables without heating them to 160°F. The packagers blanch them, but there is a chance they could get contaminated after blanching, which is why some frozen vegetable packages say they should be cooked before eating. So if you want to be on the safe side, parboil or microwave the peas, then substitute ice cubes for some of the water for a cool soup. Possible substitutions include using a bouillon cube, stock instead of water+bouillon, cream instead of coconut milk, 2 tbsp lemon juice instead of the half lemon, and you could also add more garlic or mint depending on your taste. You could use fresh peas, but that would be a lot of shelling, and the peas would have to be super-fresh for them to be good. I don’t usually buy frozen peas, so I was a bit overwhelmed with all the options. I ended up following a recommendation of Trader Joe’s Petite Peas that I found with a Google search. If anyone has a favorite brand I’d love to hear in the comments. Mint is super easy to grow at home in a pot, as long as you don’t forget to water it occasionally. I’ll be featuring it in some smoothie recipes soon. The ease of using peas makes me wonder about using some of them in other less focused savory soups, roughly based on my generic V8/gazpacho inspired blend. I’m also wondering about making a similar recipe but with other herbs, possibly as a warm pea soup. I really loved this soup and found the sweetness of the peas to be quite marvelous. It’s very soothing for a grumpy stomach. With the arrival of cold nights, I decided to try this soup hot, i.e., just warming it after blending. I deleted the mint and added raw carrots. Other ingredients (plus or minus) reflected taste choices and pantry availability. It was super quick and super delicious.